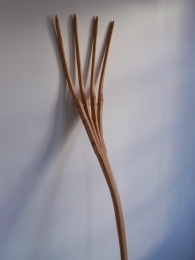 Green woodworking is an old way of working wood. Simple, functional crafts such as chairs, stools, and hayforks have long been made from green, or unseasoned wood. The simple secrets of traditional woodcraft have been handed down, from generation to generation, for centuries. Today, green woodworkers help to preserve these craft traditions by using the tools and techniques of the past. They split green wood straight from the log, shape the material with hand tools, and join it together using age-old skills. There is something about handmade crafts that connects us to the past, and enhances the beauty and meaningfulness of our everyday lives.